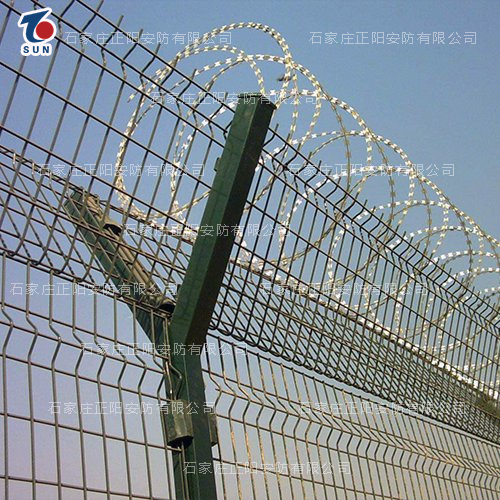 Airport security fence - Hebei Zhengyang Wire Mesh Products Co., Ltd. The razor wire is stamped from a hot-dip galvanized steel sheet or a stainless steel sheet with a sharp blade shape, a high-tensile galvanized steel wire or a stainless steel wire as a core wire. Because the gill net shape is unique and difficult to touch, it can achieve excellent protection and isolation. The main materials of the product are galvanized sheet and stainless steel sheet. It is welded with 5.0mm high strength low carbon steel wire. The mesh has V-shaped ribs to greatly enhance the impact resistance of the fence. 1. It has the characteristics of beautiful, practical and convenient transportation and installation. 3. Adding four bending ribs in the horizontal direction of the airport fence network, while increasing the overall cost, the mesh strength and aesthetics are significantly increased, which is one of the most popular at home and abroad. 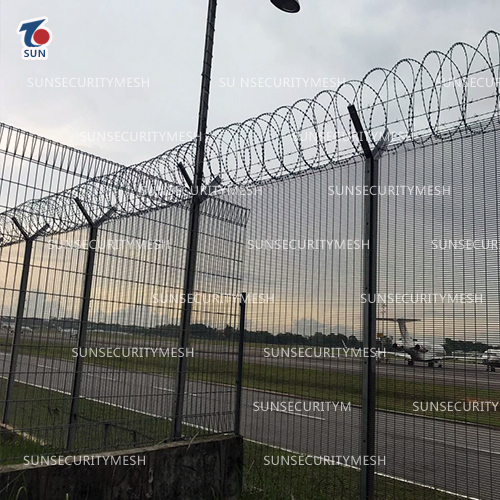 2.If the blade barbed wire and the blade barbed wire are added on the top of the airport fence net, the safety protection performance is enhanced. 3.Due to its high safety and anti-climbing ability, the mesh connection method adopts special SBS fastening parts, which effectively prevents artificial destructive disassembly and laterally bends the reinforcing ribs, so that the strength of the mesh surface is significantly increased. The packaging papers of the products are all packaged and can be customized according to customer requirements. Isolation and protection of airports, roads, railways, and bridges, security of airports, ports, and docks, isolation and protection of parks, lawns, zoos, lakes, roads, residential areas, hotels, hotels, Protection and decoration of supermarkets and entertainment venues.